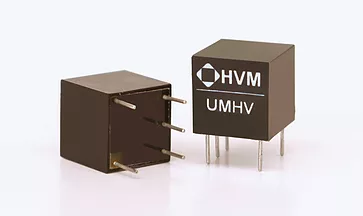 The UMHV Series is a family of ultra-miniature single-output DC to DC converters supplying up to 5kV in 0.125 cubic inches (0.5” x 0.5” x 0.5”). These ultra-compact converters are ideal for applications requiring small size and ease of use. A high impedance programming input makes it very easy to use, eliminating the need for a low impedance adjustable power source voltage. HVM’s proprietary resonant converter design minimises quiescent current and operating noise while delivering maximum performance and reliability. A special feature of this power supply is its extremely low input current, typically 1/10th of that of similar devices on the market, making it ideal for battery powered applications.